Gold-plated brass key ring, leather is laser engravable. Individually gift boxed. One of our most popular mantle clocks measuring 7 3/8" wide x 2 3/8" deep x 9" tall with 3 1/4" x 1 1/8" engraving plate included. This mantle clock has a piano finish wood center which is framed by two brass pillars with a beveled piano finish wood base and top. Can be displayed on a desk, bookshelf or mantle. 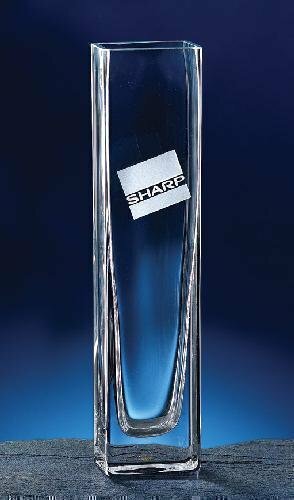 Perfect for employee awards, achievement awards, executive gifts, boss or secretary gifts and sales person awards. This gorgeous large mantle clock measures 11 1/4" wide x 2 1/2" deep x 11 5/8" tall with 4" x 2" engraving plate included. Boasting piano finish wood and brass metal accents, this mantle clock is perfect for any award presentation such as employee awards, executive gifts, service awards and more. The Glass clock face reveals detailed working gears of the clock. The Liberty Award is designed to be an everlasting symbol of gratitude and honor. Give this award to an individual worthy of the highest praise. This beautiful glass desk clock award measures 7" wide x 1 3/4" deep x 7 5/8" tall with 3 1/4" x 1 1/4" engraving plate included. Lift-out glass for easy engraving with elegant chrome metal accents and a piano finish wood base. A gift award for employees, service, appreciation, leadership, or give this desk clock award as a gift for executives, secretaries and bosses.